Through rain, shine, sleet, or snow, first responders will be there in our time of need. The Thurmont Guardian Hose Company’s Annual Banquet was no exception, with several of the featured volunteers called away to combat a house fire on the Catoctin Mountain. But, the show must go on, and the banquet didn’t miss a beat. The food was served, memories were shared, and the banquet got underway to celebrate and recognize all of the hard work the men and women of Guardian Hose Company puts forth day after day. A moment of silence and recognition for the dedication and accomplishments of five members of the Guardian Hose Company was held, whose passing in 2018 was felt by each member of the area’s fire and EMS community. Diane Oxendale, Elwood Riffle, Richard Kaufman, Marion W. “Bill” Rice, and Gloria Clabaugh were honored through their families with the lighting of a candle and Reverend James Hamrick’s blessing. Guardian Hose Chief Chris Kinnaird was responsible for the minutes of the banquet, informing the public on the past year’s events and statistics, accolades for administrative and operational officers, and future plans for the fire company. The Top 10 Responders for the year were highlighted for their loyalty and service: Larry Duble (102), Michael Beard (124), Stacy Stackhouse (147), Steve Strickhouser (163), Christopher Kinnaird (194), Terry Frushour (200), Mike Duble (254), Jared Snyder (261), Wayne Stackhouse (271), Brad Weddle (421). The officers who were inducted for 2019 are Lieutenants Chad Brown, Brian Donovan, Will Gue, and Kevin Welch; Captain Blaine Schildt; and Assistant Chief Charlie Brown. “I’m sure they will support me throughout the year, as they have done in the past. I thank them for stepping up to the plate and taking these positions,” Chief Kinnaird said. It was a tremendously busy 2018 for the Guardian Hose Company, running nearly 700 calls in just twelve months. As a company that is depended upon day in and day out, entirely functioning on the efforts of volunteers, the dedication of the operational and administrative officers doesn’t go unnoticed. Volunteer fire companies thrive on the shoulders of invested community members who aim to support and protect the public. The communication and teamwork among local departments is paramount to maintaining the safety of the Catoctin area. As President Wayne Stackhouse continued to acknowledge each member and their years of service and membership to the fire company, a few stood out among the crowd. Donald Stitely and Richard Wilhide joined the sixty-year club, putting in more than a half century of service to Guardian Hose Company. “I want to make note that William “Bill” Rice was our oldest member on record before his passing last year, and he had completed seventy years,” Stackhouse said. 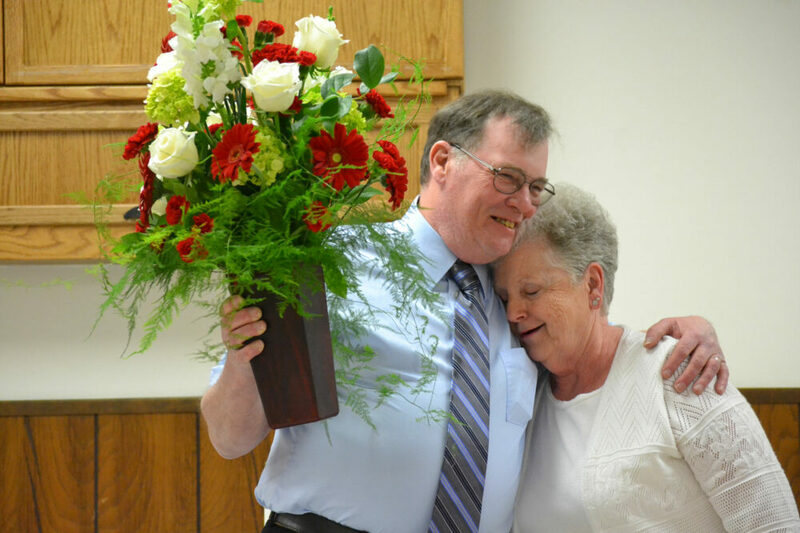 Davis was presented with a framed certificate and a huge bouquet of flowers, and the emotion on her face was immediately apparent. The gifts weren’t done yet for Davis though, as she also received a lifetime membership, certifying that she will receive membership benefits and privileges for her hard work and dedication to the Guardian Hose Company. The banquet ended with the official installation for the 2019 officers by Director of Volunteer Fire Services Director, Chief Kevin Fox: President, Wayne Stackhouse; President Emeritus, Donald Stitely; Vice President, Terry Frushour; Secretary, Lori Brown; Assistant Secretary, Tisha Miller; Treasurer, Chad Brown; Assistant Treasurer, Beverly Frushour; Trustees, Brian Donovan, Jared Snyder, Joe Ohler, Steve Yuengling, and Christopher Kinnaird. Operational Officers: Chief, Chris Kinnaird; Assistant Chief, Carroll Brown; Captain, Blaine Schildt; Lieutenants, Chad Brown, Brian Donovan, Will Gue, and Kevin Welch; and Chaplain, James Hamrick. The Installation of Officers puts the Guardian Hose Company and its supporters in a position to be successful for yet another year. As a volunteer fire company, Guardian Hose is always looking for more help and dedicated volunteers. For more information, contact one of the company’s officers or visit www.guardianhose.org for more information. 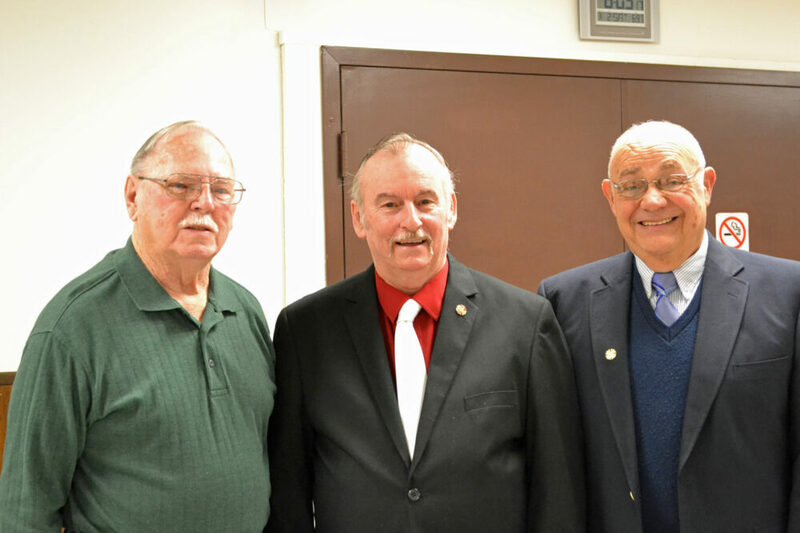 President Wayne Stackhouse (center) acknowledges Richard Wilhide’s (left) and Donald Stitely’s sixty-years of service. Vice President Terry Frushour is shown with Linda Davis, who receives a beautiful bouquet of flowers, as well as a lifetime membership.